Shortly before Carrie turned 40, she stepped on the scale and was shocked and devastated to see the number 276. Within hours, she signed up for a local boot camp that guaranteed results. She had nothing to lose....except unwanted pounds. She made an appointment with the trainer, listened to his advice and told him her goal was to lose 100 pounds. Fourteen months later, she had lost 120 pounds, 14 pant sizes and felt better than ever. She admitted that although her body ached, she knew something had to give and that it would all be worth it. Carrie wanted to look in the mirror and like what she saw. This meant completely revamping her food choices and exercising consistently, rain or shine. 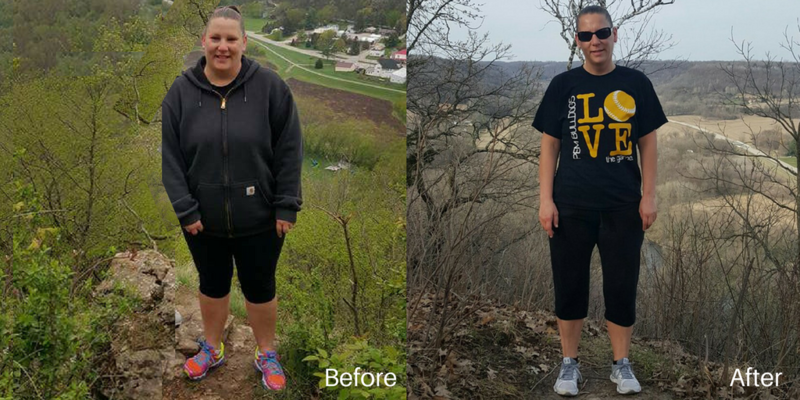 It took almost 3 months before Carrie actually noticed results, but once she could see the change, it motivated her even more. Some ways she stayed on top of her exercise routine included attending drop in classes, especially the Saturday morning classes, like Indo-Row and Pilates. "This is a complete lifestyle change, it’s not done overnight, it’s not easy, and you are going to cry and get frustrated. But learning to love yourself all over again, is completely worth it. Looking in the mirror and being able to smile, it’s worth it. I feel like a new person, who has a positive outlook on life and love who I have become. I want to inspire and help anyone who asks me my story." In addition, Carrie ran her first 5k on April 1 this year in 34 minutes! Way to go, Carrie! You are indeed an inspiration, so thank you for sharing your story with us! Click for more Member Success stories. The tears of happiness are rolling as I read this. I am so proud of you as is the rest of our family that don’t see this, you are an inspiration!!!!! !